Hope everyone had a swell week! I first of all want to extend a huge thanks to the new gals who have started following my blog! I am so glad to have you along! A quick post today as life is a bit hectic at the moment. It is Friday and time for a brand new challenge at Crafty Catz! This week, the lovely Dianne is hosting and she has chosen a vintage theme. So, this week we would love to see vintage cards. Other - circle punches for flowers, pearls, cream lace from Kaiser, Marvy tag punch, brass butterflies by Vintaj Natural Brass Co., foam spirals from Magnolia, Stampin' Up antique brad, glimmer mist by Tattered Angels, Tim Holtz Fancy and Floral Frames embossing folder, ribbon from stash. If you are looking for more inspiration, be sure to check out the wonderful vintage cards my teamies have created. I hope you will be able to join us this week and look forward to seeing your projects! Thank you so much for stopping by! I really appreciate your comments; thanks for taking the time to leave them! Have a great weekend! A wonderful card, love all the layers, embossing, flowers and lace, and such a sweet image too. Hiya Dawn this cards beautiful i love the colours, image well all of it! Oh my...couldn't go wrong with this....kitty, lace. embossin'....my kinda card...just lovely! Oh this is gorgeous. What a lovely image you used. Perfect paperchoise and beautiful decorated. Thank you so much for joining us at Stamptacular Sunday Challenge this week. What an adorable kitty stamp! Fantastic card. Thanks for sharing with us. 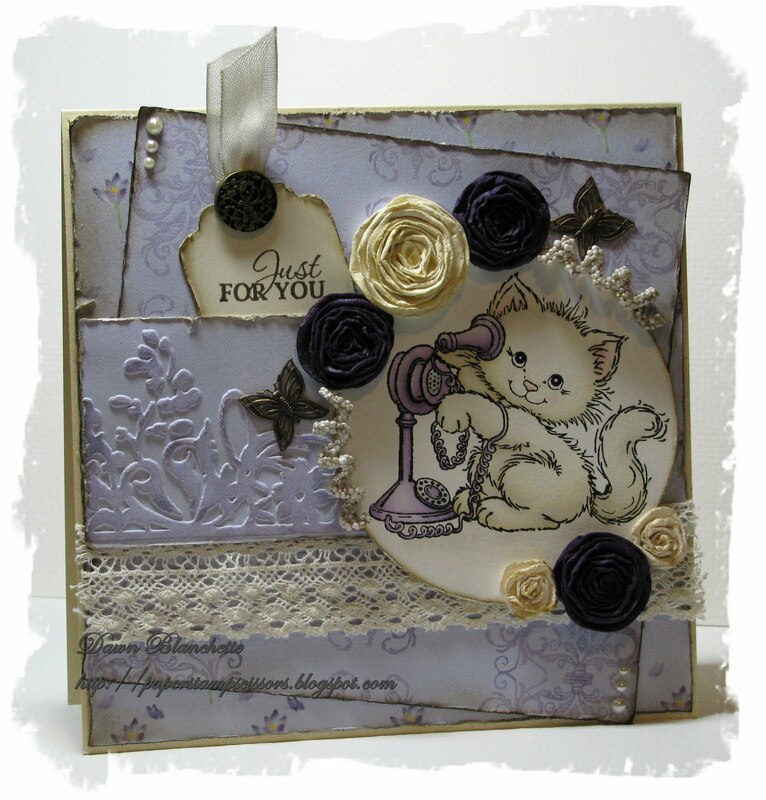 What a pretty card - love the lilac and that darling kitty! So glad you linked up at Craft Us Crazy!